Hardwood Euchre 2.0.410 – Fantasy theme takes on the classic card game. 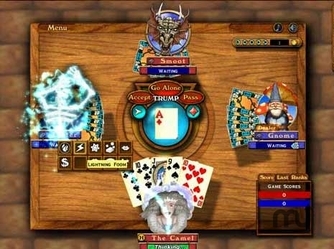 Home / Mac / Hardwood Euchre 2.0.410 – Fantasy theme takes on the classic card game. Hardwood Euchre offers a great way to play classic Euchre along with other more unique variations to keep things exciting. Not only can you play for yourself, but you can play online with people from all over the world, 24 hours a day. Why would you try Hardwood Euchre ? Cool 3D effects. This is not boring Euchre, it's Euchre with some real kicks! With cards that move and flip as the real deal. Classic Euchre and more. Try 7s Euchre to mix things up. Buy only what you want with micro transactions. The game is divided into parts, you can only buy the parts you want and leave the parts you do not. We add more parts like tires, environments and avatars you can pick up if you want. Performance. Euchre has various achievements you can earn. This adds a fun, new way to play euchre. Leaderboards. Hardwood Euchre has his own online leaderboard. See where you rank in the list. It is effortless, as each game is automatically registered for you. Data Ticker. Find out what happens to your own ticker just like the news. We show you who in the community earns cool performances, or shows the top manager of the game you play in an appropriate ticker format. Note: Although the software is classified as free, it offers in app purchases.